Home of the Grimaldi Palace and the old town, this charming part of Monaco is a delightful place to visit. The Rocher de Monaco (The Rock) is the heart of old Monaco and the home of the ruling Grimaldi family. Towering over the city and the port, the Rock is reached either via elevator or by walking up a series of ramps and stairs. The views along the way are stunning and provide opportunities for frequent breaks in the climb! Atop the Rock is the Place du Palais, with the Palais Princier, home of the Grimaldi family. 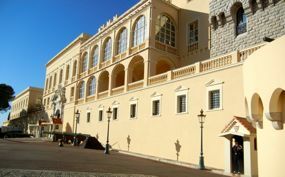 The Palace is relatively young, dating from the 17th century, although the Grimaldi reign began in 1297 when François Grimaldi came from Genoa and captured Monaco. Some vestiges of the ramparts remain. The Palace is guarded and there is a daily changing of the guard. The public rooms are open to visits from April through October. From the Place du Palais you can wander through the narrow streets of the old town. Colorful buildings in pink, yellow, and orange create a lively scene. Many now are souvenir shops and restaurants. The Cathédrale is also in the old town and includes the tombs of the royal family. Its design shows Byzantine influences. The Chapelle de la Miséricorde is nearby. Built by the Black Penitants in the 1600s, it was renovated in the 1800s. At the far end of the Rock, overlooking the Mediterranean, is the grand Musée Océanographique. It was founded by Prince Albert I, who was a serious researcher and oceanographer. It includes an extensive aquarium and a large collection of skeletons of marine mammals. The Musée Océanographique borders the beautiful Jardins Saint-Martin. These beautiful gardens slope down to the sea and include numerous plantings of trees, flowers, and shrubs, with blooms year round. Above, The Grimaldi Palace, on the Rock (Le Rocher), Monaco. 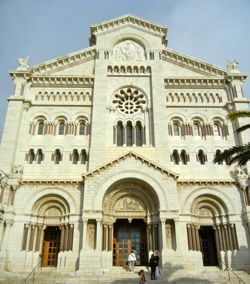 Below, The Cathedral, Le Rocher, Monaco.